Consistent accuracy lies in well-trained muscle memory. 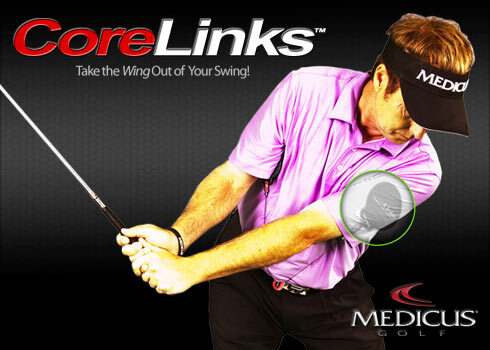 The Medicus CoreLinks teaches you the feeling of keeping your upper-arms connected to your body. When separation forms between your body and upper-arms, you are more likely to swing "over-the-top" - causing a slice, hook or pull. Simply clip the CoreLinks retraction reel to your belt and maintain upper-arm pressure on the pads. If you fail to keep your upper-arms connected to your body, throughout the swing, the CoreLinks pad will fall and conveniently retract back to your belt clip. 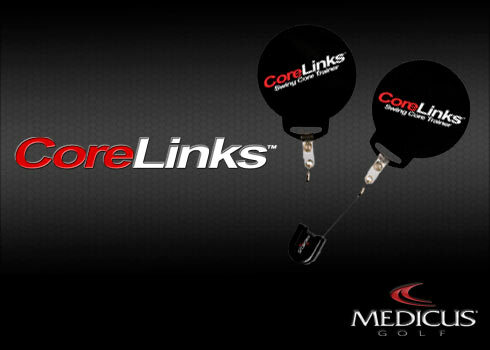 Medicus CoreLinks is a revolutionary training aid in helping you maintain the proper swing-path. Helps stop you from picking the club up on the backswing to prevent a pull or slice. Keeps arms from raising quickly on follow through preventing a hook. Easy to use Portability allows you to take on the go. Conveniently attaches to belt strap Maintains proper swing geometry. Gain a solid feel for how your arms should rotate on your golf swing. All CoreLinks come in one size that fits all. Available with Black or Red Retraction Reels.